While we weren’t able to meet at the Walnut Creek Library last week, we did manage to have a great time sitting in the café at Barnes and Noble. Well, if you’re willing to try again, so am I! So, come join me at the library this Wednesday, December 29th, after 10:30. I’ll be sitting in the teen section upstairs. Just look for the big purple couches. Let’s have a conversation about what you’ve been reading!! I can’t wait!! As I lay in bed this morning wondering why I was awake at 5:00 a.m., I had to listen to this rather annoying battle. 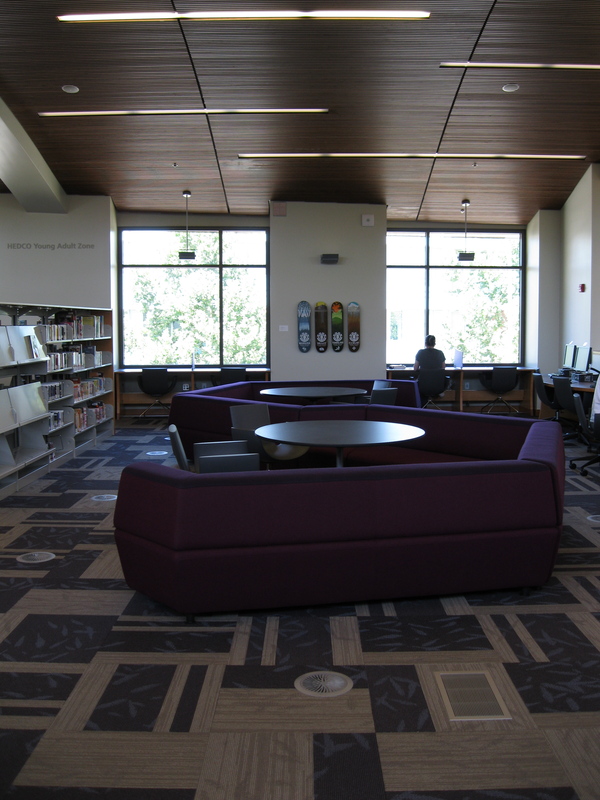 The battle was between my still-recovering body, wishing for a few more hours of sweet, non-cough-interrupting sleep, and my head that was looking forward to seeing my students at the most beautiful library in Northern California (one of them, anyway), anxious to get the day started! Before you start making phone calls (“Hello, funny farm?”), keep in mind that I’ve been under the influence of cold medicine for several days. My thoughts are not always entirely my own. No, seriously. Put the phone down. Back to this morning…eventually my head won out and I got up and prepared for my day. Everything I needed was already in my backpack: laptop, iPod, notebook and pens, and, of course, my book. I was ready! I share this description of my morning with you for one reason: So that you may better understand my dismay when I arrived at the library and, after paying my parking fee, discovered that the library was CLOSED! That’s right! CLOSED! “Due to budget cuts.” Budget cuts? Is that why they did NOT close the parking garage? Because they wanted some poor teacher to pay her $2 parking fee before discovering that the library was closed?! That was particularly irksome! And then the disappointment set in. I was so looking forward to sitting on those lovely purple couches in the teen section with my kids, talking about our favorite books. Alas, ’twas not to be. Plan B was quickly put into action. And that’s “Plan B” for “Barnes and Noble.” My friend Karen and I walked with six seventh graders and one mom from the library into downtown Walnut Creek to take up residence in the cafe at Barnes and Noble. She still showed up with two. Ok, I know how she felt. I was given the same instructions and didn’t know what to do! Just one? One in each genre? One for each decade of my life? I mean, seriously…one??? After we each picked our favorite book, we met in the cafe and sat there for almost two hours talking about nothing but books! What a wonderful way to spend a morning! Honestly, if you teach literature I highly recommend spending some time just listening to your students talk about what they’re reading; about what they love to read. Not only will you learn a lot about your students, you might also learn a good deal about what they need from you as their teacher. They don’t need someone to force-feed them the books that just happen to be in your classroom cupboard or that might be on somebody’s “Every Middle School Student Must Read These Books Before High School” list. That’s the quickest way to get them to stop reading! Or worse…hate reading! Listen to them talk about the stories they love and then take a step back and let them share their books with each other. I watched in wonder one day as one student finished the book she was reading and then walked it over to another student who wanted to read the book. That student put down her own book, picked up the new book, and immediately started reading it. I watched as she carried the book with her around the classroom, reading as she went back and forth to her locker, packing her things at the end of the day. My students amaze me! As we were talking about books, I started compiling a list of recommended books and thought I’d share them here. I know there may be a few that I missed, but this is definitely a good start to any reading list. I’ve added the student recommendations here. I’ll update the list as my students make suggestions. Of course, please feel free to add your own suggestions in the comments. We do love books!!! Come join Mrs. Bailey and me at the Walnut Creek library Wednesday, December 22nd. We’ll be there after 10:30 and will stay at least until lunch. You can find us in the teen section upstairs, most likely. So, let’s talk about books…what you’ve been reading, what you’ll be reading, and get some ideas of what you can read next! 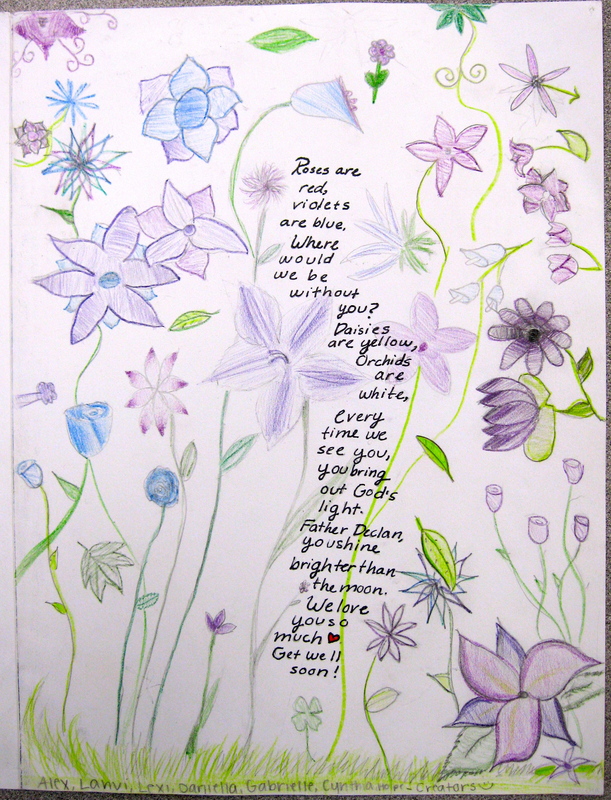 This is the inside of a card a group of my seventh grade girls created for Father Declan last week. They wrote the poem and they illustrated the card so that the entire class could sign it. I believe it is the most beautiful card I’ve ever seen! If you’re looking for a little extra help with math or science, I would highly recommend this site!